Originally posted: September 24, 2018 . Last modified: December 31, 2018 . Ground Turkey Stuffed Peppers are a great weeknight dinner option. Full of rice, turkey, tomatoes, and cheese, everyone will ask for seconds! 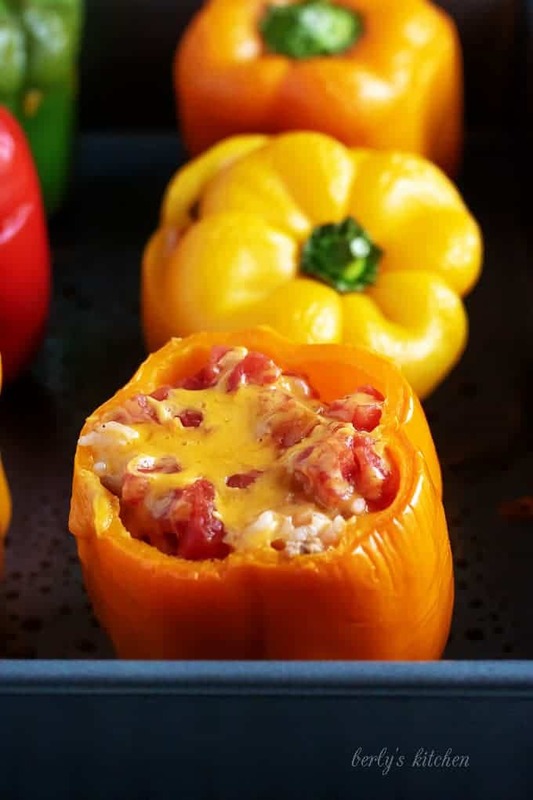 Stuffed peppers are such a classic meal. My family had them when I was a small kid, but I don’t remember ever making them myself. A few days ago while grocery shopping, I picked up a package of ground turkey thinking it was needed for a recipe. It wasn’t. We hate to waste food, so the turkey had to go to good use. It just so happened that I bought a few too many bell peppers that same day. It made since to make ground turkey stuffed peppers. These peppers are a meal within themselves. However, they also go great with our Cheddar Bay Biscuits, smashed red potatoes, or oven roasted broccoli. 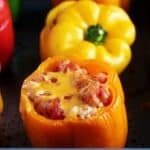 How Do You Make Stuffed Peppers? 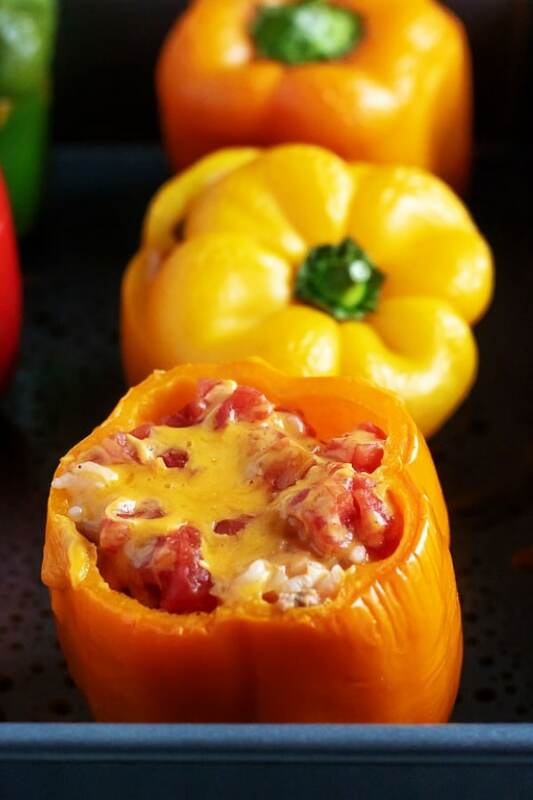 Stuffed peppers are super simple to make. This recipe is easy to switch up in regards to ingredients and tastes. Be sure to check out the “Tips” section for more information! Start by preheating the oven to 350 degrees and lightly greasing a 9 x 13-inch baking dish. Wash and dry the peppers then cut off the tops. Carefully remove the seeds and membranes taking care not to tear the pepper. Set aside. Drain the juice off the tomatoes, but don’t toss it out. You might need it later. Save a few tablespoons of the diced tomatoes, too. We like to top the peppers with the tomatoes, as well as, cheese. If you’d rather not put tomatoes on the top, no need to set any aside. 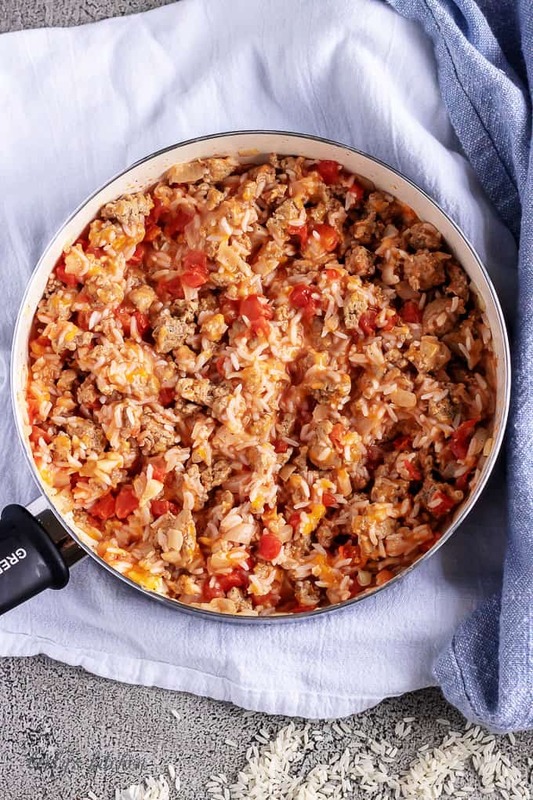 Place the ground turkey in a large skillet over low-medium heat. Use a spatula or wooden spoon to break it into small pieces while it cooks. When the turkey is cooked about halfway through, add the onions. Continue to cook while stirring occasionally. When the turkey is almost completely browned, add the garlic. Cook until the turkey is cooked through then drain any excess grease. Return the pan to low heat. Add the tomatoes (without their juices), cooked rice, and 1 cup of cheese. Mix until well combined. If needed, add a couple tablespoons of the reserved tomato juice to add some moisture. Our meat was a little on the dry side, so I added some of the tomato juice to keep it from drying out in the oven. Place all six peppers into the baking dish, and fill with equal amount of the ground turkey mixture. Top with a spoonful of the reserved diced tomatoes. Next, add the remaining cheese. Don’t forgot to add the tops back onto the peppers. This helps to lock in moisture, too. Place the baking dish in the oven, and bake for 35 minutes. When the peppers finish cooking, remove from the oven and allow them to cool for several minutes prior to serving. The tops can be eaten, too, except for the stems. 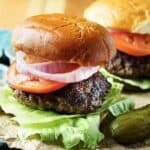 Can I substitute another meat for turkey? Yes, chicken or beef both make great options. On the same note, if you don’t care for bell peppers, beefsteak tomatoes can be used instead. 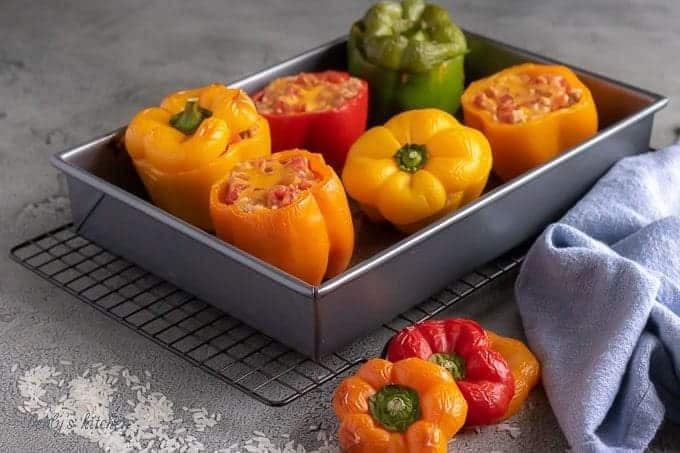 Can you freeze stuffed bell peppers? To be honest with you, we’ve never tried to freeze peppers. I can’t say for certain how these would reheat. However, here’s a well written post that explains just how to do it. Why isn’t there tomato sauce in the pan? Good question! We chose to omit it. However, feel free to pour some tomato sauce into the bottom of the pan prior to baking if you wish. It can be served along with the peppers after they’re cooked. 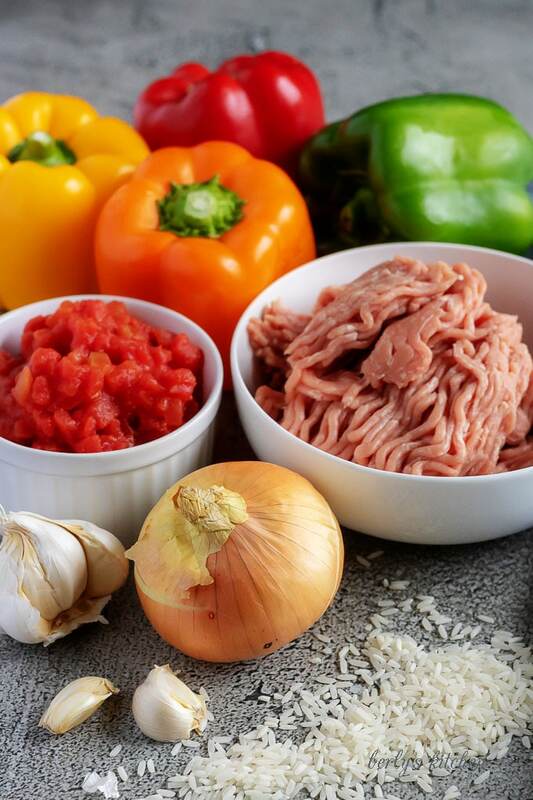 If you like this ground turkey stuffed peppers recipe, please leave us a comment and rate the recipe card. You can also find us on Facebook, Pinterest, Twitter and Instagram searching for Berly’s Kitchen! Lightly grease a 9 x 13-inch baking dish, and preheat the oven to 350 degrees. Wash and dry the peppers. Then cut off the tops and set them aside. The tops will be used later. Remove all the seeds and membranes. Set the peppers aside. In a large skillet, cook the turkey over low-medium heat and break apart into small pieces. When the turkey is about half finished cooking, add the onion. Continue to cook while stirring occasionally. Add the garlic just as the turkey is finished browning and cook for an additional 30 seconds. After the turkey is completely browned, drain any excess grease from the pan. Add the tomatoes, cooked rice, and 1 cup of the cheddar cheese. Cook over low heat until all the ingredients are incorporated and the cheese is melted. Taste and use salt and pepper if desired. If the filling appears too dry, add a little of the reserved tomato juice a tablespoon at a time until the filling reaches the desired consistency. Line the 6 peppers (tops removed) in the baking dish. 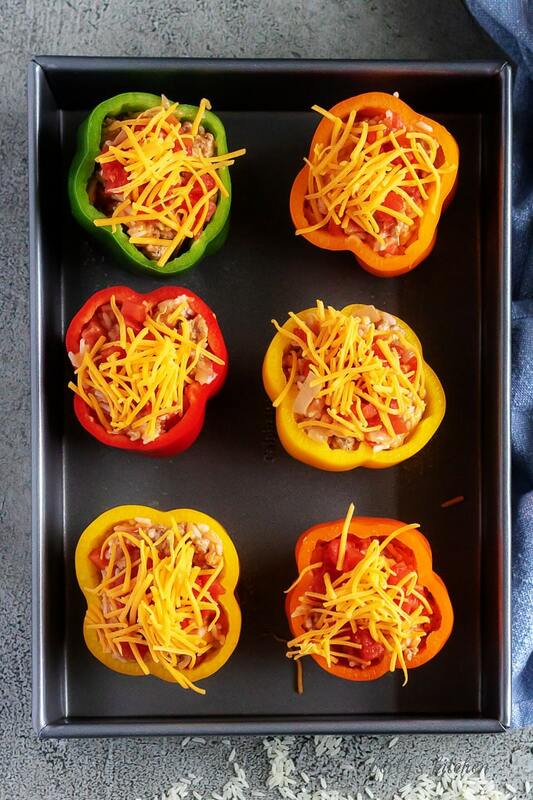 Fill each pepper with equal amounts of turkey filling. If you decided to save some diced tomatoes (as noted in the ingredients), spoon each pepper with a few of the tomatoes then top with the remaining cheese. Add the tops back to the peppers, and bake for 35 minutes. *Calories listed are an approximate and may vary depending on the size of the peppers/filling used.